The lawsuit, filed Wednesday by the Freedom Foundation, accuses Seattle of violating its own laws and land-use code by issuing a construction permit to the nonprofit Low Income Housing Institute for a tiny-house village at Eighth Avenue North and Aloha Street. The city of Seattle is being sued amid neighborhood resistance to a new tiny-house village for homeless people set to open in South Lake Union. In the lawsuit filed Wednesday, the Freedom Foundation, a conservative-leaning think tank based in Olympia, accuses the city of violating its own laws and land-use code by issuing a construction permit to the nonprofit Low Income Housing Institute for a tiny-house village at Eighth Avenue North and Aloha Street. The lawsuit asserts that the city skirted laws requiring an environmental review of the Aloha Village project, failed to do adequate community outreach and violated an ordinance limiting the number of transitional homeless camps. “You can’t create a law and then pretend it’s not there,” said Richard Stephens, an attorney for the Freedom Foundation. Stephens expects the lawsuit will be quickly resolved — within six months — because it is a land-use petition. “If the court rules that the city did it wrong, then the city will have to do it the right way,” he added. Seattle’s human-services department referred questions to the City Attorney’s office. “We fully intend to defend the city in this suit, and we’re currently assessing the claims,” Dan Nolte, spokesman for the office, said in a statement. Against the backdrop of Seattle’s homelessness state of emergency declared 31 months ago — and a recently reversed $275-per-employee head tax meant to fund homeless services and housing — proposed solutions have undergone intense scrutiny by the public. On Thursday, at a city-led community meeting in South Lake Union about the proposed village, frustration manifested in interruptions, jeers and pleas for compassion. Seattle Mayor Jenny Durkan approved the Aloha tiny-house village in South Lake Union last Friday as part of her plan to add about 500 emergency shelter beds within the next 90 days. 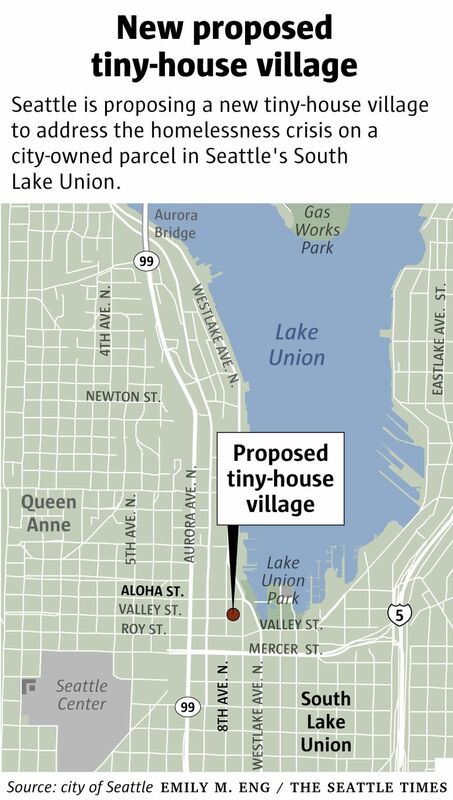 Pending environmental testing, 54 tiny houses would be built on city-owned property a block west of Lake Union Park. The city has not said when it will open the village. Seattle currently has seven sanctioned encampments or tiny-house villages for homeless people, and is planning to add at least one more beyond the Aloha site. Though a 2015 ordinance limited the number of sanctioned encampments to three, then-Mayor Ed Murray cited special powers under the state of emergency in siting an additional three encampments last year. The Durkan administration recently sited the city’s seventh encampment in Whittier Heights. The city’s increasing reliance on tiny houses has drawn concern from King County’s human-services director and the U.S. Interagency Council on Homelessness, but the strategy costs about half as much as the city’s enhanced model of indoor shelters and it is supported by Durkan and the city council. With a standing-room-only crowd of about 200, more of the speakers opposed the Aloha village than supported it, but cheers suggested the crowd was evenly split. Chief among the concerns were crime and drug use and a lack of transparency. Many speakers cited Licton Springs Village, a “low-barrier” village model designed for those with alcoholism and chemical dependency, as an example of how a tiny-house village threatened the safety of a neighborhood. They demanded to know if Aloha Village would also be low-barrier and allow drug use on site. Tiffany Washington, of Seattle’s Housing, Health and Human Services Department, said that Aloha Village would not be low-barrier — in response to community feedback — but that staff would not conduct unauthorized searches of the tiny houses. Many were angered by this decision. “It’s not low-barrier? It’s the definition,” someone cried out from the back. “They’re not kids,” someone in the crowd replied. Many were exasperated that the village was approved without more community input. “The decision’s made, so what’s the point of the public hearing?” said Elisabeth James, of Speak Out Seattle. A few speakers said that, given that the decision had been made, they wanted to make it work. Tracy Roberts, of Belltown, asked practical questions about what quiet hours would be, if neighbors could volunteer, and what the fence would look like. Those who support Aloha Village said that it was the best available option to get homeless people sheltered, and could be a steppingstone to a better life. “I feel like we need to work with each other in the opposing groups, but it’s hard for me to feel that the predominantly white middle-class, upper-middle class people are disconnected,” said Sue Hodes, a resident of Columbia City and a housing activist. She was drowned out by equal parts cheering and booing. Washington intervened and reminded attendees to respect one another. Interspersed with accusations of Seattle wasting money, not listening to community feedback and increasing crime in South Lake Union were calls for compassion. “I want to live in a place where we’re compassionate, where we take care of one another, and we’re smart enough to figure out that being poor does not mean somebody is a criminal,” she said. Loud cheers of agreement followed.